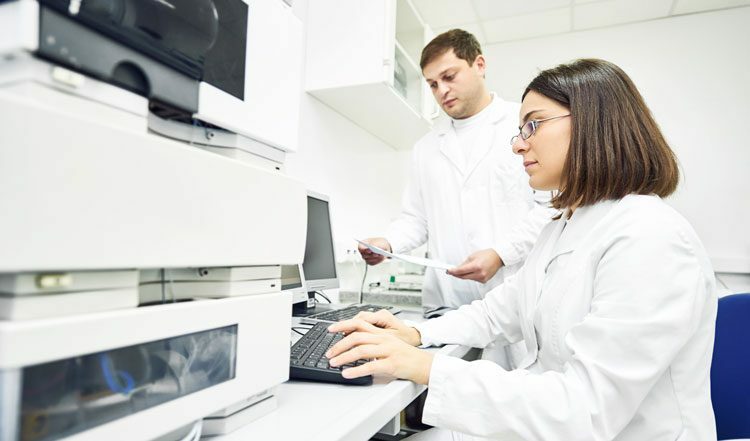 Two-dimensional liquid chromatography (2D-LC) has obtained increasing focus over the past two decades. 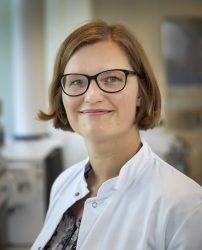 At LEO Pharma, we continuously evaluate new laboratory techniques with the potential to advance our drug discovery and development. We installed a MHC 2D-LC 18 months ago and have found it valuable in a broad range of applications. 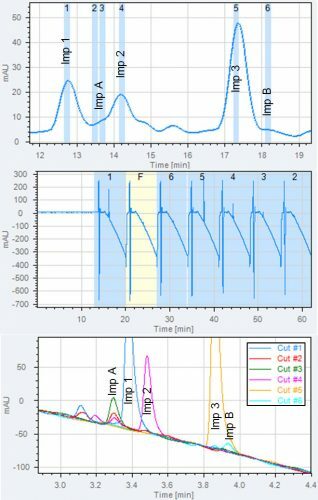 This article covers how we use the system in our analytical troubleshooting laboratory and how it can be applied to solve key tasks in the lab. Figure 1: Our MHC 2D-LC system. 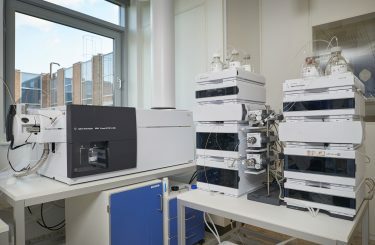 Two HPLC systems are connected by a valve system. The valve system allows for cutting and storage of up to 12 cuts at the time, all cuts are analysed in the 2D as this become available. When MS detection was added, significant tailing of the API MS signal was observed due to saturation of the MS. In addition, massive signals from the excipients in the drug product were observed over a large part of the chromatogram. Chromatograms illustrating this troublesome case are presented in Figure 2. Figure 2: Removal of interference by 2D-LC. 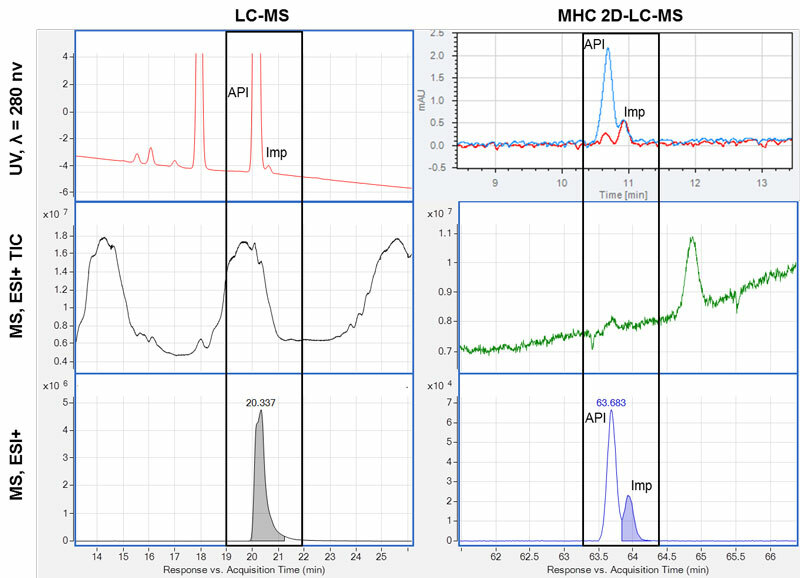 Six chromatograms of a sample analysed by LC-MS (left) and by MHC 2D-LC-MS (right) are shown. The time segments where the impurity (API) and the active pharmaceutical ingredient (API) elute are marked with a black box. A: top, UV chromatograms at 280nm; middle, MS total ion chromatograms (TIC), dominated by eluting excipients; bottom, MS compound chromatogram – only the API is found. 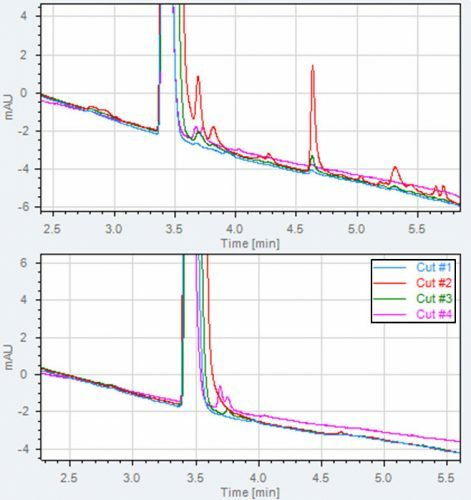 B: UV chromatogram overlay of two cuts across the impurity; middle, MS total ion chromatograms (TIC) with no/minimal signal from excipients; bottom, MS compound chromatogram with two compounds observed corresponding to the API and the impurity. a main peak are shown in the figure. A: the 1D UV lamp is on and impurities are observed in all four heart-cuts. B: the 1D UV off, in heart-cut 1 and 2 no impurities are observed, in cut 3 and 4 small impurities are observed. We use four methods in the second dimension; these are chosen to have different selectivity within the reversed phase separation space. We have learned it is important that the 1D and 2D columns have comparable hydrophobicity to ensure acceptable peak shape. The starting point of the 2D gradient is to some extent decided by the 1D method. LARS DENCKER NIELSEN is a Principal Scientist in Analytical Support at LEO Pharma. 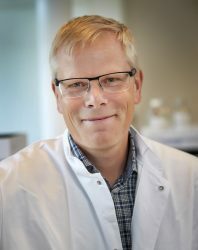 He has worked with analytical development and troubleshooting in the field of chromatographic separations and mass spectrometry for small molecules within pharmaceutical research and development for more than 17 years, and had earlier worked with environmental and pesticides analyses in the same field for another five years.